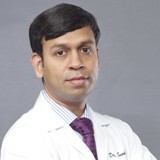 Dr. S Sunder Rajan completed his MBBS and MS in ENT, Head and Neck surgery from India’s premier medical institute - JIPMER, Pondicherry in 2000. Subsequently he worked in the same hospital as an assistant professor before moving to Pondicherry Institute of Medical Sciences and later joined NMC Healthcare. His areas of interest include endoscopic sinus surgery, microear surgery, paediatric ENT (with a focus on adenoid and tonsil surgeries, grommet insertions, foreign body removal from every area of the head and neck including challenging airway foreign bodies). He routinely performs diagnostic procedures like nasal endoscopy and laryngoscopies. Dr. Sunder Rajan has attended innumerable workshops and conferences to remain updated on the latest concepts and technologies. He has also delivered a host of lectures as part of CME programs for the medical fraternity. He is well versed in English, Hindi and Tamil.